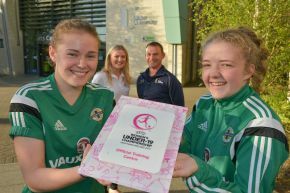 Pictured (l-r) in the foreground are Northern Ireland U19 players Sarah Connolly and Emma McMaster. Leanne McCready, Women’s U19 Championship Tournament Co-ordinator, IFA and William Moore, Performance Services Co-ordinator at Ulster University are also pictured behind. Ulster University has been awarded official training venue status for the upcoming UEFA Women’s U19 European Championship, which will take place in Northern Ireland from 8 to 20 August 2017.